A hand-painted, museum quality model of the fearsome Carnotaurus. A Papo Carnotaurus (Papo Carnosauria) dinosaur model with articulated jaws. A hand-painted museum quality model of the ferocious Carnotaurus (Papo Carnosauria). A Papo Canotaurus dinosaur model. Helpful speedy service from Everything Dinosaur. A wonderfully detailed Carnotaurus model in dynamic mid-stride. (considering the legs are so spread eagled it stands remarkably well unlike the Papo Allosaurus). The overall paint finish and the bird-like feet are particularly convincing. Worth adding to the collection! As a matter of fact, abelisaurids are not my favourite group of dinosaurs, but this one cried for purchase. 🙂 Nice, dynamic posture (especially grateful for the non-tripod stance), fantastic details. Looking forward to this years stunning aces: Cryolophosaurus, Ceratosaurus and Acrocanthosaurus! A nice model, it has good colours, a great pose and has fabulous details. A limnoscelsis would be cool. I’ve bought 6 Papo dinosaurs for my son and they are by far the best on the market. Carnotaurus is in keeping with their high standards. Excellent service from Everything Dinosaur on every purchase. Just got it. Amazing figure. Superb service. Thanks again. In my opinion this is the best dinosaur model Papo has ever done. And one of the best models ever created. The realism & detail is astounding. From the stubby little hands to the horns on it’s head or the meticulously sculpted teeth, everything is just perfect. Easily rivaling custom resin models that go for hundreds or thousands of euros. As always the service was amazing. Being from outside of England I’m always surprised at how fast my orders get here. This model is nothing short of astounding. Papo has ‘taken inspiration’ from Sideshow’s Dinosauria range Carnotaurus sculpture, but made subtle changes by widening the snout a little and placing the left hind leg on the ground. Outside of that, the model is just gorgeous. The ammount of detail packed into this model, particularly on the head, is amazing. As an added bonus, since this was inspired by the Sideshow sculpture, this model may go down as one of Papo’s most scientifically accurate models to date and easily their best figure since the Papo Allosaurus. I highly recommend this model for any dinosaur collection. Papo may ruffle some feathers with their lack of originality, but the ammount of detail put into each model is worth the money, and only Papo seems to possess that organic believability. Other figures may be more accurate, but only Papo’s look alive! Add this to your collection. You won’t regret it! I prefer evil reptiles and this one has just met my T-Rex, Spino and Allo. On to the next!! !Just a note: PLEASE PAPO PRODUCE MODELS A LIIIIITLE BIGGER!!! Hot on the heels of the running T-Rex and the Allosaurus comes this little beauty, another triumph of detail and dynamism which can stand proudly alongside the best models in the collection! The precariously yet exquisitely balanced form is sculpted in a lunging position with beautiful attention to the detail of the muscles and skin. Carnotaurus was such an odd-looking animal this model could easily have missed the mark but Papo have hit it dead-on. Even the realistically funny, stumpy little arms and fingers do not detract from how impressive this model looks. Its expression is suitably cunning and oozing with menace, and the detail on the head is superb. It is generally VERY well painted, there even seems to be a slight difference in the paint used within the model’s mouth to make it more glossy and moist-looking. Excellent! I really, really hope Papo have more ideas for their dinosaur series in the pipeline. I can’t get enough of them! Thank you Papo! This Carnotaurus is one of the best that Papo has ever made, the detail and paint work are amazing and the delivery service is quite in time. All in all, a very worthy owing dinosaur toys in 2013. Papo keep outdoing themselves with amazing models, and this Carnotaurus proves it. What surprised me is that the model itself is small, but filled with so much detail. The pose it is displayed in make it feel like a real animal on the prowl. 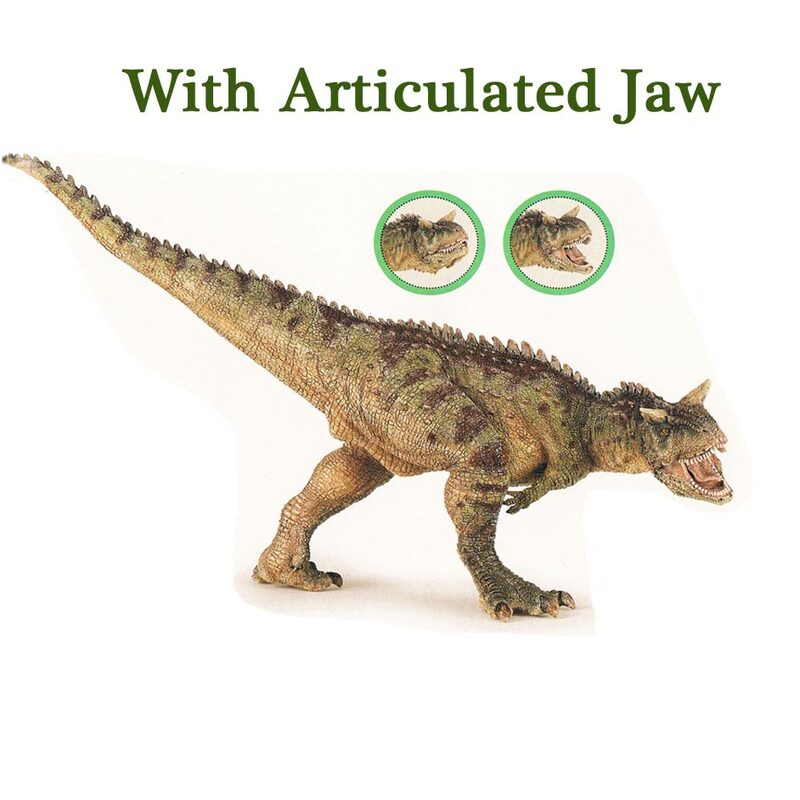 The jaw moves as well, showing off a deadly set of teeth. This Carnotaurus is the best I’ve seen in a long time. Hopefully, Schleich’s will be just as good. Would definately recommend. An amazing and beautiful model.